Unfortunately, there were times in my adult life I didn’t always have time to apply that logic. Chalk it up to being too busy building a career, busy with friends and family, busy with other activities that were important to me, or sometimes, I was just too tired… staying on top of clutter was not always a top priority, so things accumulated. The big wake-up call for me was a couple of years ago when I replaced the flooring in the entire house. It was at that time that I really noticed how much a closet can hold. After seeing and moving the entire contents of my house over three weekends, I decided then and there that a MAJOR purging was required. The house did not look messy or cluttered in itself, it is just that the closets (out of sight, out of mind) were sometimes avalanches-waiting-to-happen. Some of their contents comprised useless stuff, frankly. It was time to get brutally objective and start purging. There were some obvious things that were easy to purge, things for which I no longer had a use or an attachment. Those were either donated or thrown out, depending on their condition. Next was paper… it took a very robust filing system and a few attempts to refine it until it worked flawlessly for finding things quickly. I eventually found a method that worked for me and shredded old and useless documents along the way. Next were the items with a sentimental attachment. That is not an easy process. However, I had no problem putting those items aside and allowing myself the time to take the walk down memory lane, then deciding if it was time to say goodbye to the item. If not, that was ok as long as the item was in good condition and I had a place for it. As long as I was making progress and saying goodbye to a steady stream of “stuff” that I was prepared to part with and that represented no sentimental attachment, then I was feeling a sense of accomplishment. Sometimes, when visiting a sentimental item set aside as little as a month or two later, I was ready to part with it. For me, the best trick to see progress was my resolution to toss 1 cubic foot of “stuff” per week. Think about it in terms of one to two standard shoe boxes per week. I am not talking about regular garbage or recyclables, I mean “stuff” from the accumulation pile. Even in a busy week, it can be an achievable target. Once I have met my 1 cubic foot quota, I don’t have to think about it for the rest of the week. 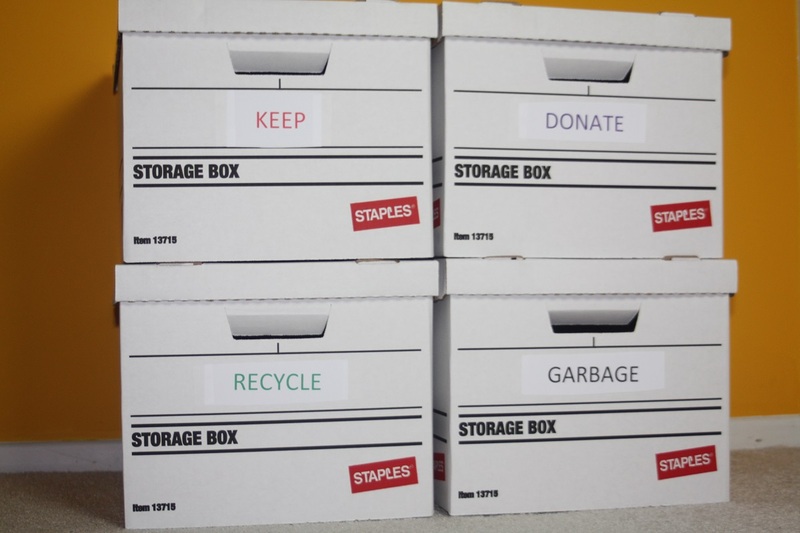 Whether that means bringing a bag of gently-used clothes for donation, shredding outdated paperwork, or going through a stack of old magazines or books, or a combination thereof. One cubic foot per week is pretty easy. Imagine… at the end of one year, there would be 52 cubic feet of extra space and less “stuff” to dust, to clean or to maintain. The trick is not to fill it up again with newer “stuff”. With my 1 cubic foot resolution, over time, I found the clutter pile gradually but consistently diminishing, without the shock to the system as some people experiences on “Hoarders”. I was parting with things when I was ready. De-cluttering can be liberating and energizing when you have less stuff to clean, dust or maintain, thus giving you more free time and more breathing space. Actually, as I get older, I find the de-cluttering process gets easier. The more I realize that life is about people and good times together, the “stuff” that it generates is just that… it’s just stuff. Good memories don’t take up space. We always have lots of room for those. – Set an easy weekly goal for yourself, whether that is 1 cubic foot per week, one hour of de-cluttering activities per week, one closet or cupboard per week, one box from the basement or attic per week. Find a goal that works for you and helps you see steady progress. – Once you have freed up space, try not to acquire more “stuff” to fill it up again. – Consider adopting a neutral policy: for every item you bring in, a similar item should go out. For example, if you get something new for the kitchen, maybe you can find something of equivalent size that you do not use anymore that could be donated. – Once you have decided on items to donate, ask family and close friends if they are interested in any of them as you never know if there might be an opportunity to keep something in the family and still bring joy for years to come. – Try to limit the number of collections or hobbies. Each collection or hobby takes space and time. Focus on the ones that you are most passionate about, that energize you and bring you joy. – To minimize the potential of books, magazines or newspapers accumulating, try reading a sample issue or sample chapter on your computer, tablet or reader. If you are comfortable reading them that way, then consider subscribing to your favourite publications electronically. – If you suspect that something you are hanging on to might be valuable, certainly, hang on to it! When you have the time, research its value through web sites like eBay or Kijiji then seek the advice of appraisal professionals like auction houses and art or antique appraisers. Before you sell anything, you might consider getting a second professional opinion. Who knows, you might have a surprise moment like “Antiques Roadshow”, but you will never know until you ask! If you haven’t already, you can check out the rest of my blog at andrebegin.net. From there, you can click on the “Follow” button to receive future posts directly in your inbox.